Exporter of a wide range of products which include contaminated soil washing plant. By concentrating contaminants into a smaller volume of soil through particle size separation and attrition scrubbing. The majority of inorganic and organic contaminants generally bind, either physically or chemically to fine particles (clays, silts, organic matter). These silts and clays in turn are attached to sand and gravel particles in the soils. Soil washing separates the contaminated silts and clays from the "clean" sands and gravels, thereby reducing the volume of contaminated material requiring further treatment or disposal. The most important factor affecting the soil washing process is the percentage of fines (particles with a diameter less than 0.063mm) in the soil, if the percentage of fines is high then there will only be a small volume reduction in the amount of contaminated material and the efficiency of the soil washing process will be low. Generally it is considered that if the fine content of the soil is above 25% then soil washing will not be effective. More granular soils are better suited to soil washing than cohesive or semi cohesive soils. After excavation contaminated material undergoes soil processing to remove over sized objects. Contaminated material then passes to the first stage of the process, a soil scrubbing unit. Wash water and soil are vigorously mixed, pH buffering and dosing with surfactants can be included to improve soil washing. Free phase contaminants removed from the soil by the mixings and the 'dirty' water are separated from the soil and treated, the water can then be recycled. The coarser "clean" fraction gravels are separated at this stage and are usually suitable for reuse on site. The remaining mixture of water, fines (sludge) can be further sieved to remove heavy metal containing compounds, the sludge then under goes dewatering in preparation for further remedial treatment. Water treatment is also an essential part of soil washing and modular plant similar to those described in the pump and treat section of our website are commonly used. 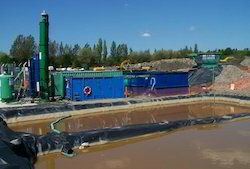 Looking for Contaminated Soil Washing Plant ?